Ski resorts in Colorado, with all of their luxurious amenities—high-speed chairlifts, pristine park features, slopes ribboned with silken corduroy—are places of snowboarding paradise. The only downside is that everything related to snowboarding is seasonal—even Heaven. After the pearly gates of the ski resorts have closed for the winter, there are always those desperate few who would sell their souls to prolong their season, if only for a few days. Powered by boredom, malcontent, and an unquenchable desire to snowboard—a crew of Coloradans headed by Will Mayo decided to take their fate into their own hands. The result was Hell Track: a gauntlet of incomparable sketchiness, a rideable torture device. Here is the video that captures their particularly painful fall from grace. There was something happening in the mountains of Colorado this spring, something a long time in the making. A group of friends got together in the woods to ensure snowboarding had a place to happen after the resorts had all closed. They were willing to spend days, even weeks, building with nothing but shovels and wet gloves, risking their health and their safety to have a chance to ride something unique. They found that their time, their sweat and their blood would all be worth it the moment they dropped in and experienced Hell Track from the driver's seat. Named after the bmx course in the movie "RAD" from 1986 (which was before any of these guys were born, myself included), this course was supposed to be for snowboarding what the original was for the movie: a sort of climactic end to our season. The major difference: this was not a race, it was an adventure, this was for the joy of going where we had not been before. It was supposed to be intimidating even when only straight airing through it, and with immovable obstacles like trees integrated directly into the tightly packed features, it was only a matter of time before it reminded us of our mortality. So it’s the end of April and the big parks are all closed; mud season has come over Summit County. Mud season can mean no jobs to worry about, camping, road trips and a lot of potential fun for this crew, so I would like to take this chance to thank them all for just sacrificing their time to join me in this vision. Seth Hill, my girlfriend Judi Blondin and myself got things started. We built for 3 days without even touching our snowboards. We got the first and largest kicker done, cut a pole jam and raised it and built most of the two landings and a crucial berm between the features. Chris Corning joined us on our fourth day and stayed through till the project was complete. At the end of the sixth build day, we called Chip Proulx to take a few pictures of us riding the top half of the course. At the end of this first session Seth tells me he has to leave in a few days to go to Europe. Since seth had put so much work into this thing and we wanted some more help to finish the next few big builds we called in the reinforcements. The next time we showed up, we saw Phil Hansen, Dillon Wilson, Ben Elliot, Adam Hohmeyer and Johnny Wilson had already built the better half of a large berm. Our crew was here! I brought up the grill that day so after we finished the berm together we all had a hot lunch and then eyed up the remaining work in front of us. There was this tree right after the pole jam that seemed to be in the way, like if you slipped out in the landing you would slam right into it. So we built a butter pad around it that ended in a step down over a 6 foot gap that went straight into the berm. As we were building this particular feature, we all slowly realized this thing was not only going to be challenging, as expected—but fairly dangerous, maybe too much so. There was this feeling in our conversation that none of us knew what was going to happen, yet no one was going to leave until it was done and we all found out how it would ride. It’s an odd thing to see when you stand back from it, all these grown men digging in the snow working as hard as any physical laborer out there but with the premise that none of them expect any formal pay. 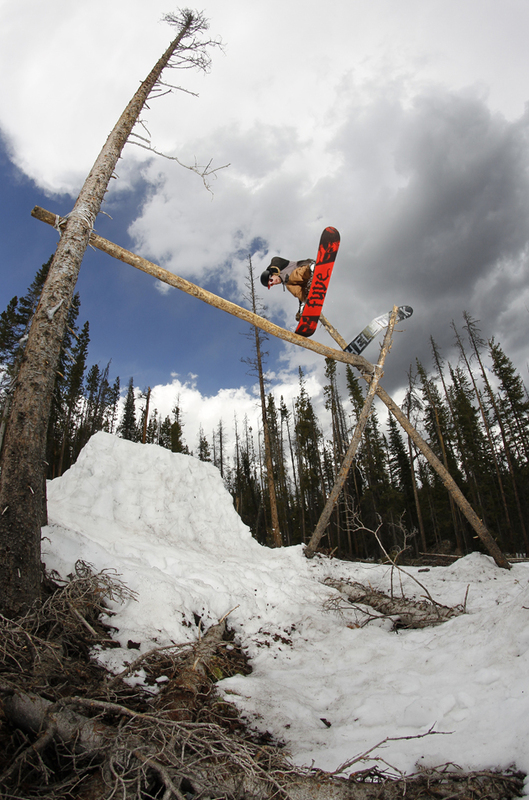 Snowboarders all have their own drive for this sport, and it’s important for the individual at this level of riding to identify their personal drive. I believe this idea was embodied and experienced by each one of us during this build, we found the work draining physically and mentally, but we kept going without any doubts that even one full day riding on this track would make it all worth it. the next 5 days we built and rode and rebuilt each feature. The remainder of our crew: Tylor Berreth, Greg Bejian, Ben West and Zach Soderholm joined us and put in their dues, as well. We raised and secured a frame for the hitching post as a team and finished its landing. After everything was in place we wasted no time hiking to the top of the track right away. The drop in was long and wound through tight trees. The upper track was only fast enough when ridden through a couple of times and salted properly. Seth was on a tear, we had finished the track before he had to go so he now had his one session and pretty much landed all the sickest stuff possible on the track day one. 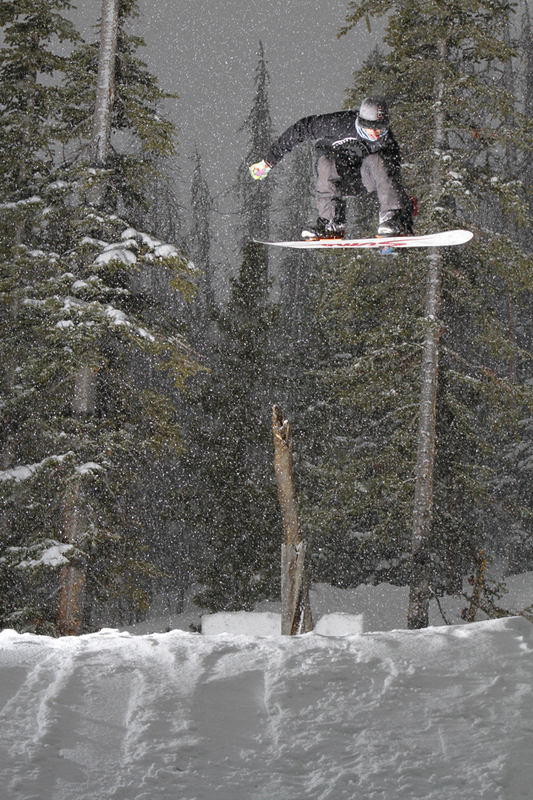 He managed to Backside 360 tap the first large gap and landed the only 540 miller flip on the hitching post. Not all of us wanted to go for a full pull on the first day, but Phil Hansen and myself also wanted to try and get some clips out of it so I followed him down with the 'ol gaper gopro helmet cam and that’s when it happened. Phil had landed the backside miller flip on the hitching post right away once it was done and also had gotten it a few times in a full pull. However, once I got the camera on him it took a turn for the worse: he misread his speed or didn't pop right or something but before I knew it I found myself flying past the landing with him with his sunglasses flying past me. He had smashed his face on the horizontal pole of the post. Nose bloodied and face already swelling, he looked up at all his friends rushing to help him out; "I have prom this weekend". It was at this moment that we all realized the name we had been giving the track was going to stick. That was just the start, over the next week of filming Hell track would routinely claim 1 new victim each day. Tylor took a bad slam and snapped his board by coming up short on the first gap, I hit a tree (board first thankfully) and Dillon nearly ripped his arm off on the hitching post. As the slams were big, so was the riding. Though we weren’t doing quad corks, this pushed all of our limits in a way which we could not do elsewear or otherwise. We found great difficulty doing some tricks that would be a breeze in the park, we challenged ourselves with simply getting through the track alive, that was how we designed the course. After all was said and done, we had found the rush we were looking for, and most of us had mild injuries as reminders. I am stoked that Hell Track got to live in reality, not just in our minds, and I would like to bring it back as an annual but unofficial spring event open to the public next year. We will see.